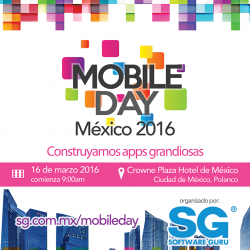 Mexico City – Mexico – February 4, 2016 – Four Js Development Tools Latin America has announced its participation in Mexico’s principal mobile developer event – Software Guru Mobile Day. The event will take place at the World Trade Center, March 16th. Bryn Jenkins, Four Js COO will be a keynote speaker and present Four Js’ vision for application development and the challenges facing software professionals today. Mobile app developers face many technical challenges when attempting to trade-off user experience with profitability. It’s possible to excel in both just as long as the objectives are clear. Mobile Day is a one-day long conference organized by leading developer review Software Guru Magazine aimed at developing enterprise mobile applications. It consists of a series of lectures, workshops and a technology showcase. Unlike most mobile development conferences, Mobile Day focuses on the business environment, where organizations need to build robust applications and where they face problems such as information integration, security, maintainability and other issues. This year, the organizers are expecting an audience of between 250-300 attendees consisting mainly of CTOs, technical leaders, architects and “software managers” who work in enterprise IT organizations and mobile development R&D centers. Tips for high performance applications. SG Software Guru is the leading media for software professionals in Latin America. Through its print magazine, events and websites, it reaches more than 80,000 unique software professionals every month. Which technologies and tools can help developers create better software? What are the best software development practices? What are the main industry trends and who are the key players? What business opportunities are available for software professionals and entrepreneurs? Software Guru Magazine. The only print media in spanish for software developers. SG Buzz (www.sg.com.mx). The most trusted source of insight and knowledge for high performing software professionals and executives in Latin America. SG Campus (www.sgcampus.com.mx) – Online education for spanish speaking software professionals. SG Talento (www.sgtalento.com) – An online profile service for software professionals, which helps them to create an attractive public profile, while guiding recruiters to find the best candidates. Events – Its flagship conference, SG Conference & Expo is held annually in Mexico City and is the most anticipated event for software developers in Mexico. Its online conference, SG Virtual, attracts more than 6,000 software professionals from all around the world for a day of free web conferences. Third-party events. SG applies its expertise to organize events & challenges for its clients.